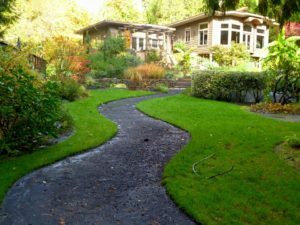 Everyone wants a beautiful lawn that is the envy of the neighborhood, but a lot of people do not know how to get that beautiful, lush, healthy, green lawn during the warm summer months. It is actually not as hard as many people would think. If you follow these simple steps along with proper spring lawn care maintenance you can have a beautiful lawn this year. First make sure your watering your lawn properly. Watering your lawn is a huge part of summer lawn care simply because for the most part it is the time of the year your lawn gets the least amount of water from rain. Normally you want to make sure your lawn is getting at least 1-1.5 inches of water including rainfall. During summer months this number sometimes needs to be adjusted a little higher, so look at your lawn and if you notice it is starting to yellow give it a little more water,1.5-1.75″ should do the trick, but make sure not to over water the lawn either. It is also best to water your lawn in one bigger session than spreading it out all week long. You will want to water before 10 a.m. You can also water at night when it is cooler, however it is best to water in the mornings because watering at night promotes fungus and disease in lawns. Second the height of mowing your lawn play a big role in the health of your lawn. When mowing your lawn during the summer months mow it a little higher than you normally would. The reason you will want to mow the grass a little higher is to protect the roots from the heat of the sun. Although sun is important to the growth and health of your lawn it is also a big factor in the “burning”, or yellowing “dead” effect many lawns suffer from during the summer. I suggest leaving your lawn at least 3-3.5″ high. You may need to mow your lawn higher than that even sometimes as high as 4″ depending on the grass type, and the heat of the sun. The third thing you will want to do is mow your lawn less frequently. During the summer months you generally want to mow your lawn less then you do in the spring and fall months. You will at most want to mow your lawn once every other week during the summer.